Dr. Jesper Liske is Associate Professor at the division for Energy & Materials. His research focuses on corrosion issues in biomass and waste fired boilers. The aim is to increase the knowledge of the corrosion mechanisms and thereby mitigating the corrosion by either improving the corrosion resistance of the material or making the environment less corrosive by e.g. 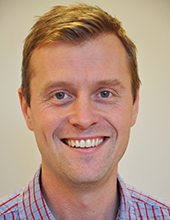 additives.Jesper is a member of the scientific evaluation panel of Waste Refinery and responsible for HTC’s IT-platform Meltwater. Sewage sludge as additive to reduce the initial fireside corrosion caused by combustion of shredder residues in a waste-fired BFB boiler. 9th Liège Conference on Materials for Advanced Power Engineering. There might be more projects where Jesper Liske participates, but you have to be logged in as a Chalmers employee to see them.